So as I am writing this Arrow has ended about 4 minutes ago and I’m extremely jazzed up from watching it. I’m just going to give my overall impressions and then after the break you can look forward to some details on the Barry bits. I will also add that I’m a huge fan of the show and it alone has made me care more about Green Arrow than I ever have before. With every episode I believe the show improves and I love keeping an eye out for all of the easter eggs and little nods. So many just in this night’s episode alone. As far as this episode goes…while a lot of the Barry Allen stuff was extremely heavy-handed I can also understand why they chose to go that route. 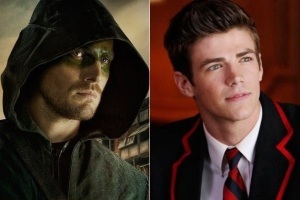 Overall they did a fairly good job introducing Barry Allen to new fans although does anyone else find themselves getting a Peter Parker vibe from Grant Gustin? I guess it doesn’t help that I rewatched Amazing Spider-Man last night. I do like how right in the first episode, we’ve established Barry’s general temperament, what he brings to the table as far as skills and resourcefulness, and his motivations. Bing, bam, boom. I can’t say that I am thrilled that certain aspects of his revised Brightest Day/New 52 origin were retained for that adaptation but I also can’t say I’m totally surprised as that was kind of the point of doing the New 52; streamlining origins and making characters easier to relate to. We also got some great hints of things to come, including a certain opposite who has yet to get his due in live-action. Please do not read any further if you do not wish to read Spoilers. Spoilers are after the break. The episode opens with a robbery at a Queen Consolidated factory/facility. The assailant is super strong and easily incapacitates the guards and makes off with an experimental device, called a Centrifuge. Obviously this is the first real appearance of Cyrus Gold (barring the teaser at the end of last episode) aka Solomon Grundy. After some drama at the Queen Consolidated offices we next see Oliver Queen (aka the Vigilante, aka Green Arrow) and his team, John Diggle and Felicity Smoak discussing with former Detective Lance theories about the break-in at his facility. In the midst of this we see a young man get off the train in the pouring rain and promptly miss a taxi. Yep, Barry Allen is officially on the scene. He finally arrives in the middle of Lance expounding on his theory and after explaining his tardiness and who he is, promptly tears apart said theory using his great attention to detail and his forensic expertise. Felicity quickly takes a liking to him which does not go unnoticed by Ollie or Diggle. When next we see Barry he is back at Queen Consolidated after being invited by Felicity to help with the investigation. She and Barry being tracking the thief, giving Ollie clues on where to find him and where he will strike. It is now when a bit of Barry’s true motives start to eek out, as he asks Felicity about the vigilante and confirms that his mom’s murder will be apart of his onscreen back story as well. I guess they needed some kind of hook I suppose. He then goes on to drop some hints that he might know a bit more about the Starling City vigilante than he originally let on. He also secretly hopes that the vigilante will be able to help him track down his mother’s killer. *groan* Just then Barry and Felicity get a hit on where Grundy might strike next and Oliver is off to try and stop him from escaping with blood from a blood bank. Just as the Central City Star Labs particle accelerator is mentioned yet again (a running subplot throughout the season so far that definitely looks to be heading towards one direction) Oliver and Dig confront Barry about the lies he has told. 1) Barry is only an assistant to a Forensic Scientist and 2) Barry originally claimed he was called in from Central City because of a similar case that occurred there and his bosses, in actuality, have no clue of his whereabouts. Barry then fesses up that he is a kind of super-natural storm chaser. Due to the nature of his mother’s death he travels to wherever strange cases of super-powered humans or events have taken place. He was also hoping to enlist the help of the vigilante in finding the real murderer. *sigh*. Oliver then kicks Barry out. Later at the Queen Consolidated welcome back party for Moira Queen the turn out is not spectacular and the guests are all kind of down in the dumps, especially Felicity who was obviously hoping that Barry would be her date before his duplicity was uncovered. Ollie of course reveals that he actually invited Barry to the party after all and Barry and Felicity further their burgeoning romance. When next we see Barry we are back at Queen Consolidated and he is being chewed out over the phone by Director Singh from back in Central City who demands that Barry return immediately before he doesn’t have a job to return to. After an awkward goodbye, Barry departs for the train station but not before giving the team one more key bit of information to help in their hunt for Grundy. Later Oliver confronts Grundy again at an A.R.G.U.S. (!) Facility and is beaten brutally by Grundy and accidentally injected with two syringes: contents unknown! Seeing that Oliver needs medical help that they can’t possibly provide, Diggle attempts to dial 911 before Felicity comes up with the idea to contact a certain someone for help. Barry is seen again missing the last train to Central City when he is kidnapped by Diggle and Felicity and brought to Oliver’s lair. The episode ends with Barry discovering that Oliver is the vigilante. So what did you all think of the first live action version of Barry Allen that we’ve seen in years? Please let us know in the comments below. This entry was posted in Media, Reviews and tagged Arrow, Barry Allen, CW, Cyrus Gold, Flash TV Show 2014, Grant Gustin, Green Arrow, Oliver Queen, Solomon Grundy, The Flash, the scientist, TV on December 4, 2013 by Devin. My internal clock today has been “Not-Arrow” time and “ARROW!! !” time. I loved the episode, as a Flash lover I was so keen to see a speedster make it to the screen (of any kind). I really liked this Barry, even if he is super young. Him and Felicity were so adorkable together, but I know they’re not gonna get together for real, which is okay cos I’m a Barry x Iris shipper! I like him but yeah, hes more of a Peter than a Barry.I think given the trends of television hes as good a choice as any. It’s funny you mentioned the Spider-Man parallel because I was thinking the same thing before the episode aired… not that he looked or seemed like Peter Parker – but that the portrayal needed an infusion of the joy you feel from Peter swinging from building to building. Wouldn’t you be overwhelmed with joy with the abilities of the Flash? I think it’s useful to have this character trait for a godlike character for comic affect when he’s facing villains that throw boomerangs (not that I don’t love Boomer).